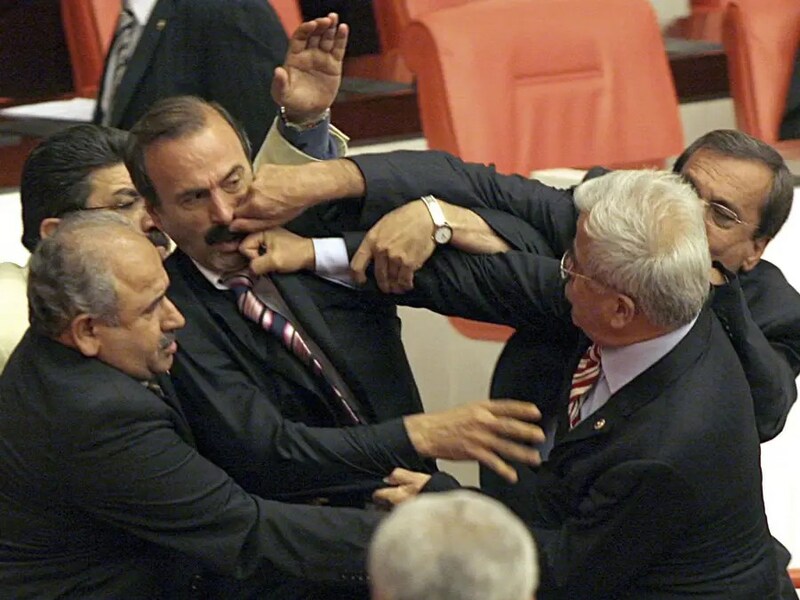 REUTERS/StringerA lawmaker from Turkey’s ruling party punches an opposition member. Politicians in North America and the European Union rarely engage in outright physcial violence. But some countries let their passions overflow a little more often. 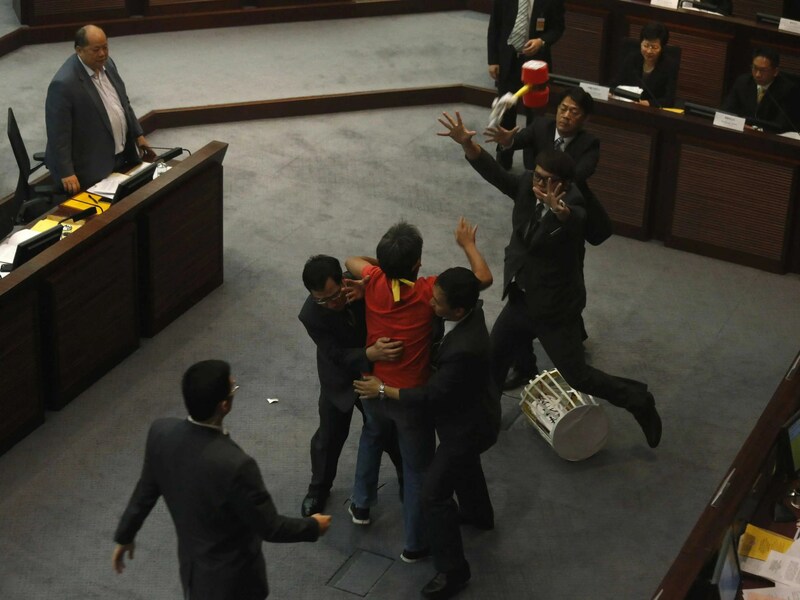 Check out these unbelieveable pictures of fights in legislatures from around the world. Grace Wyler contributed to this article. 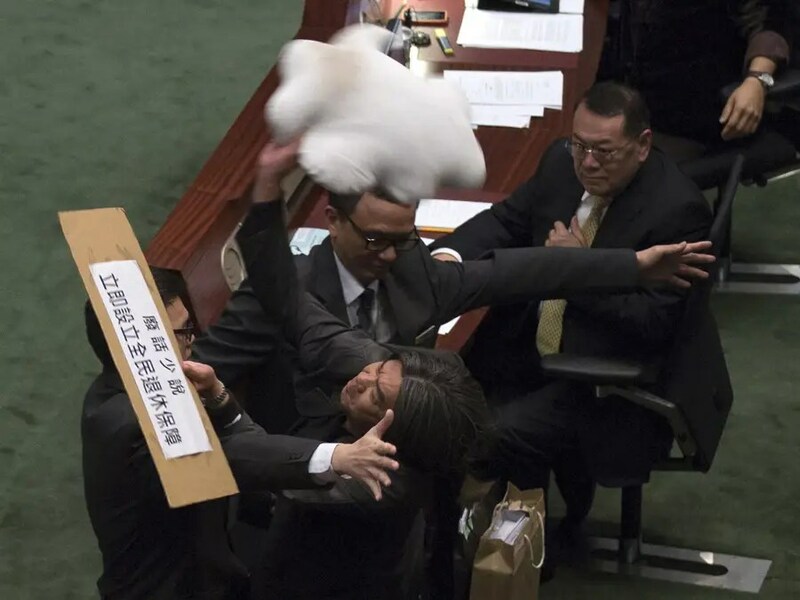 Pro-democracy lawmaker Leung Kwok-hung throws an object at Hong Kong’s Financial Secretary John Tsang. A Turkish parliamentarian falls down during a scuffle during a debate on a legislation to boost police powers at the Turkish Parliament. 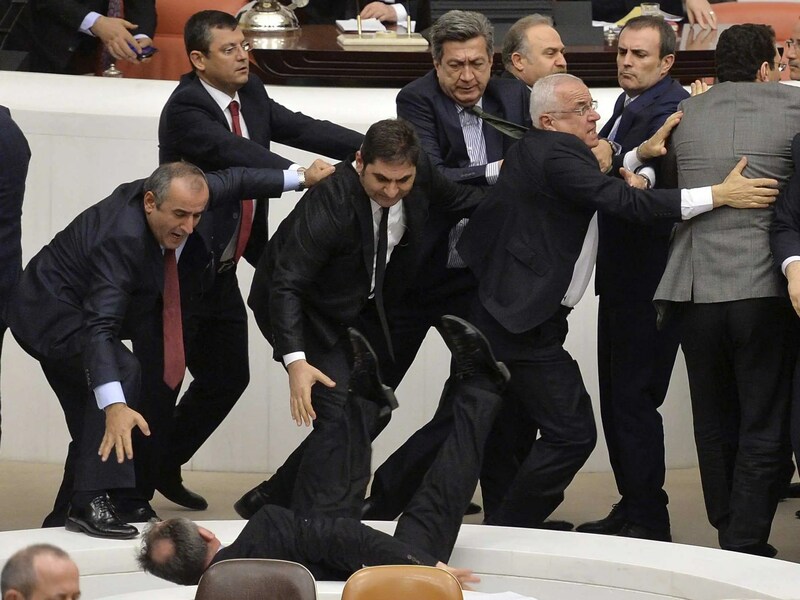 Main opposition Republican People’s Party (CHP) deputy Orhan Duzgun falls down as lawmakers from his party and the ruling AK Party (R) scuffle during a debate on a legislation to boost police powers at the Turkish Parliament in Ankara late February 19, 2015. 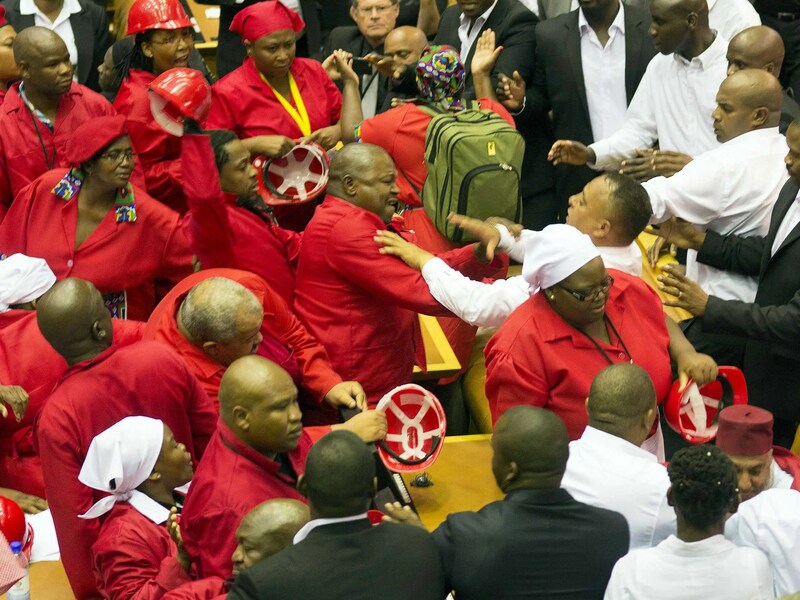 Members of the South African parliament clash during the President’s state of the nation address. 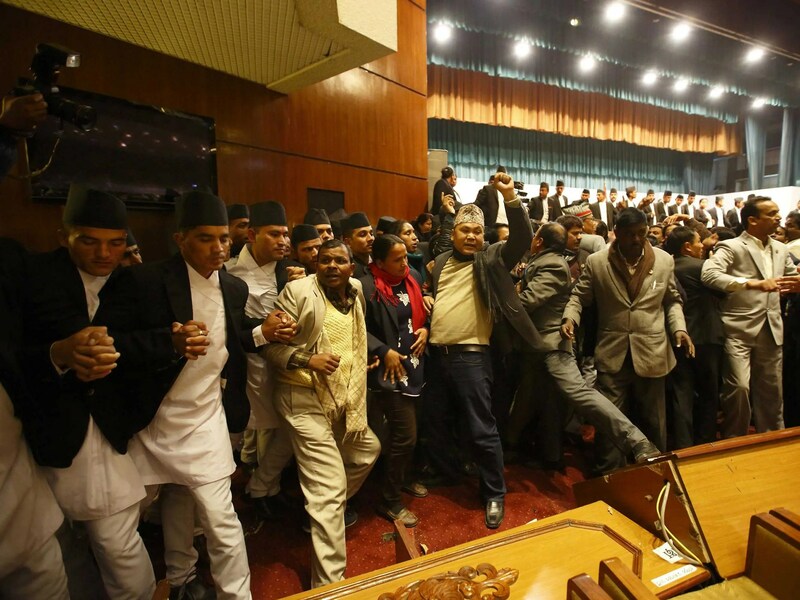 Constitution assembly members shout slogans in Nepal’s parliament. 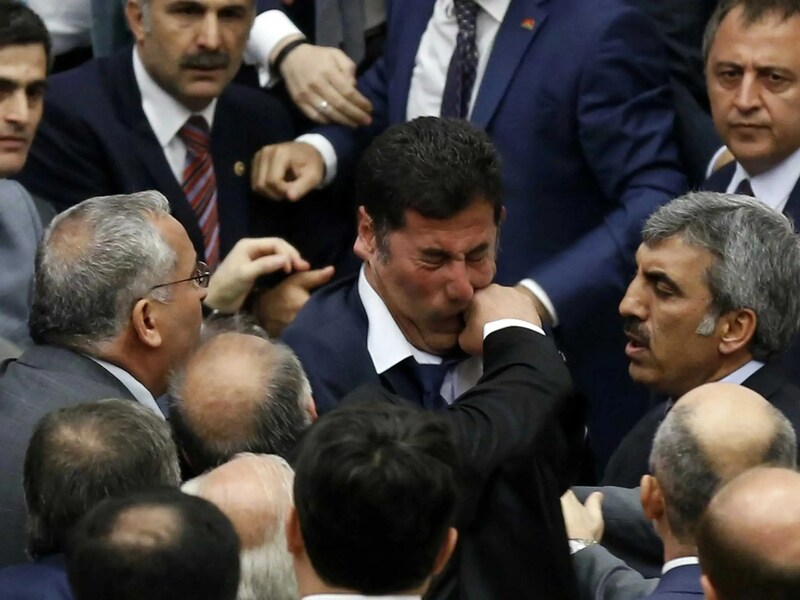 A lawmaker from Turkey’s ruling party punches an opposition politician. Pro-democracy lawmaker Leung Kwok-hung tries to throw a plastic hammer in Hong Kong. 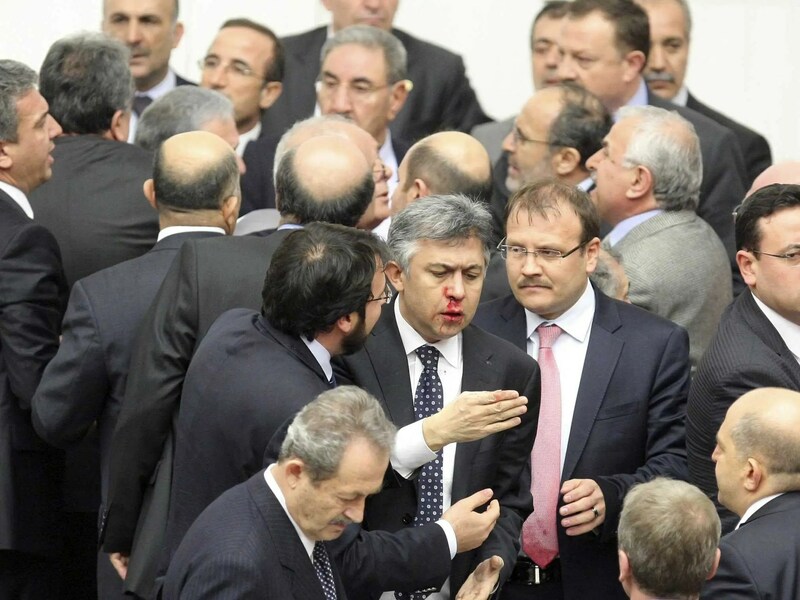 Another Turkish opposition politician tends to a nosebleed after a fight. 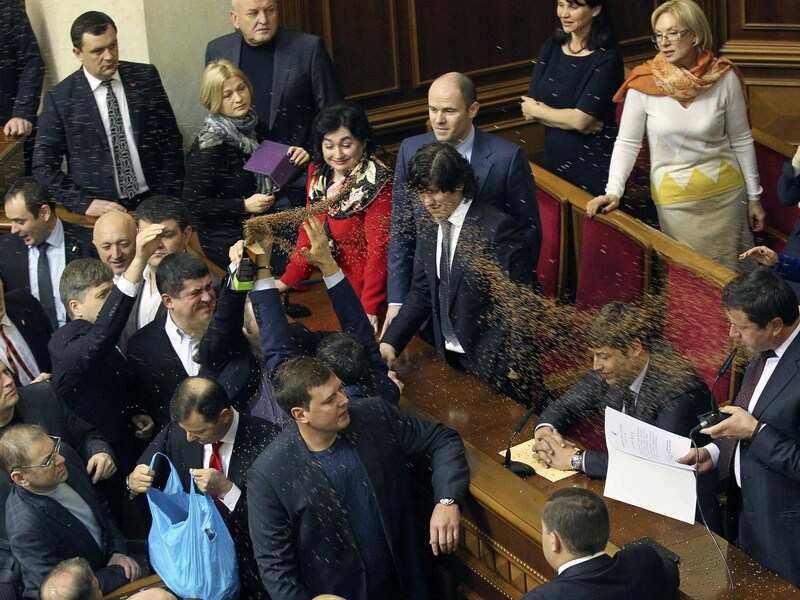 Ukrainian politicians protest against the government, throwing buckwheat. 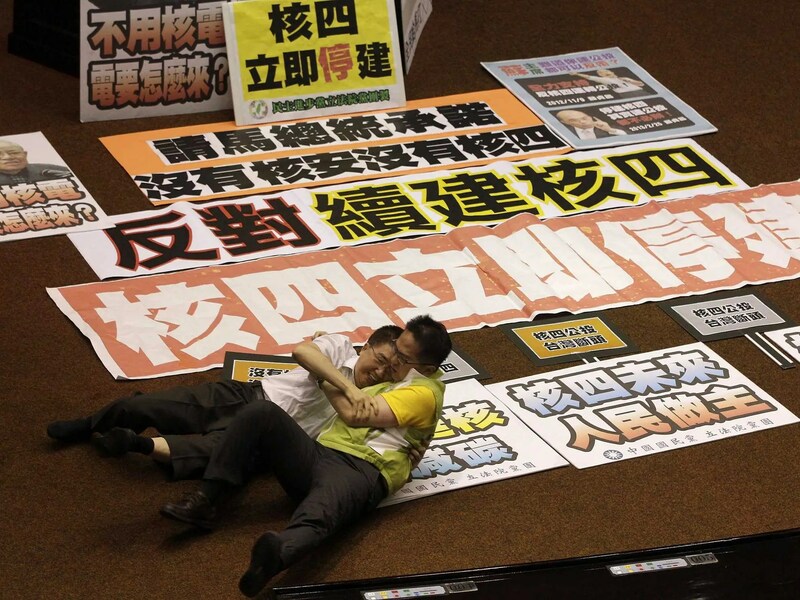 Taiwanese legislators came to blows over the construction of a new power plant. 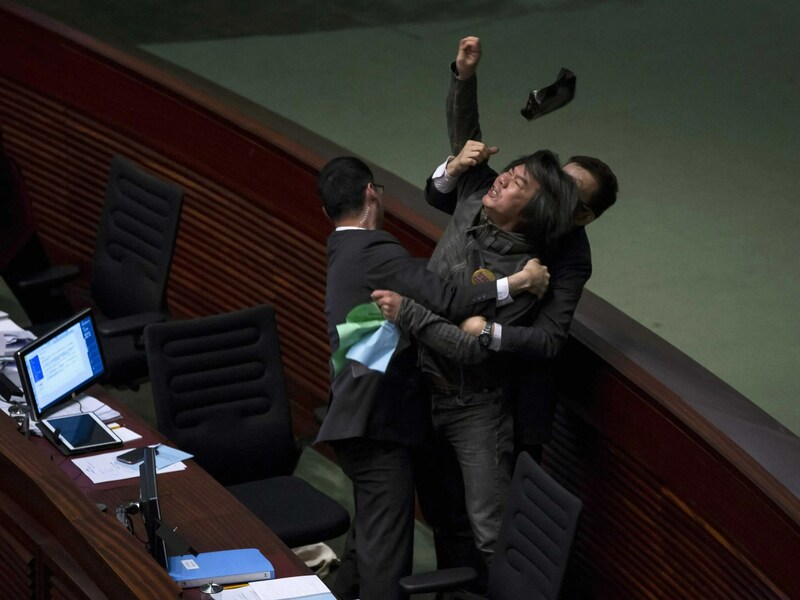 A Hong Kong lawmaker hurled a pillow at the Financial Secretary this week to demand universal retirement benefits. 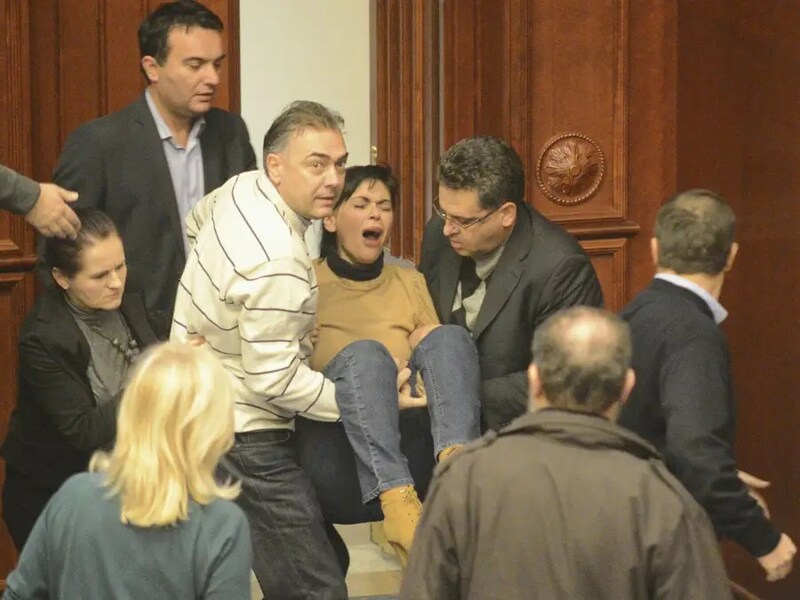 In Macedonia, violent brawling broke out in parliament over the 2013 budget. Police in riot gear had to be called in to break up the fight. 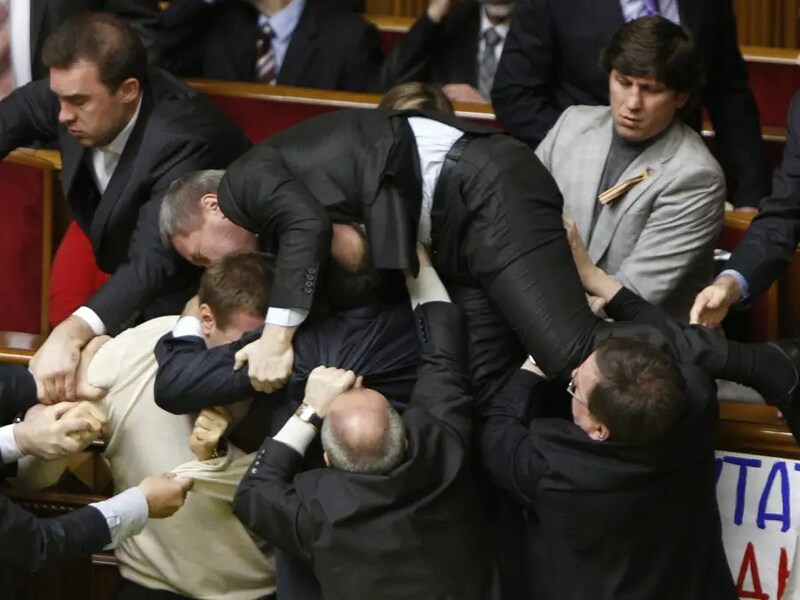 The Ukrainian parliament descended into chaos during a debate over voting rights last year. 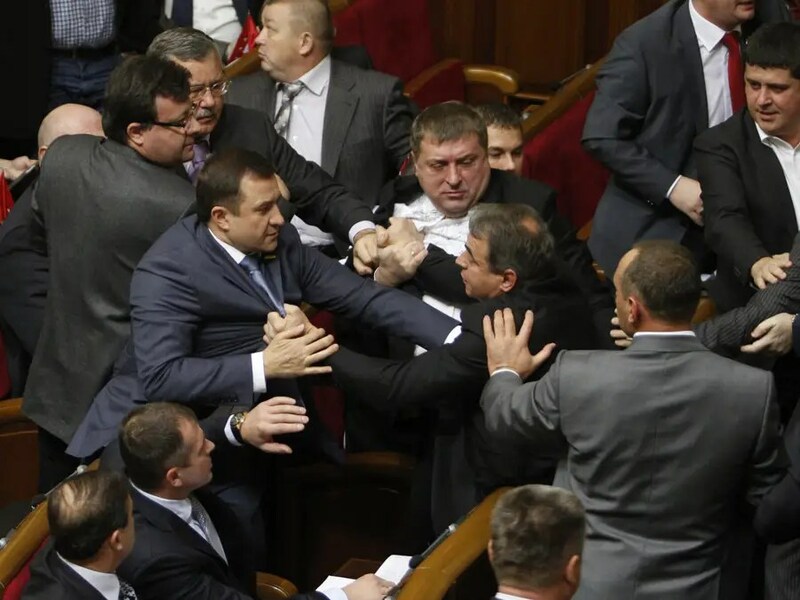 Violence is disturbingly common in the Ukrainian parliament. 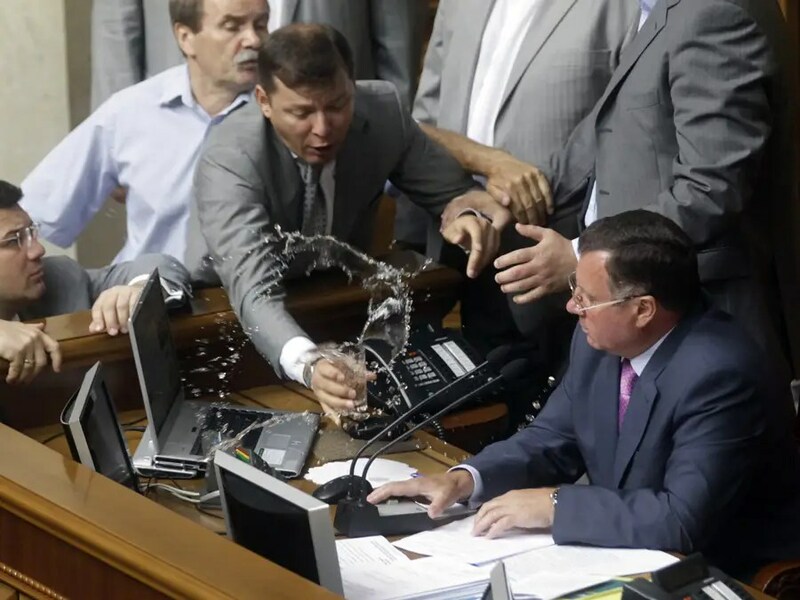 During this fight, lawmakers threw eggs and smoke bombs to protest a deal with the Russian navy. 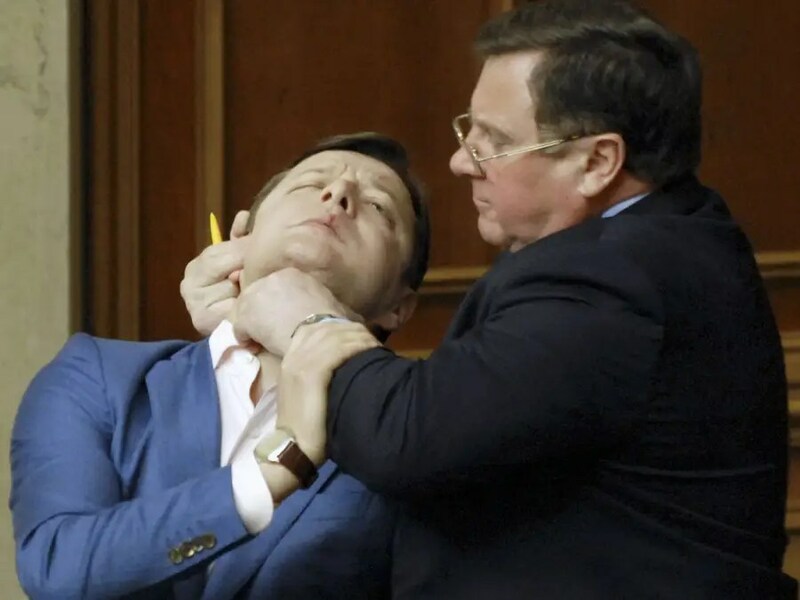 The vice speaker of the Ukrainian parliament even tried to choke a deputy once. A year later, another deputy threw hot tea all over the vice speaker. 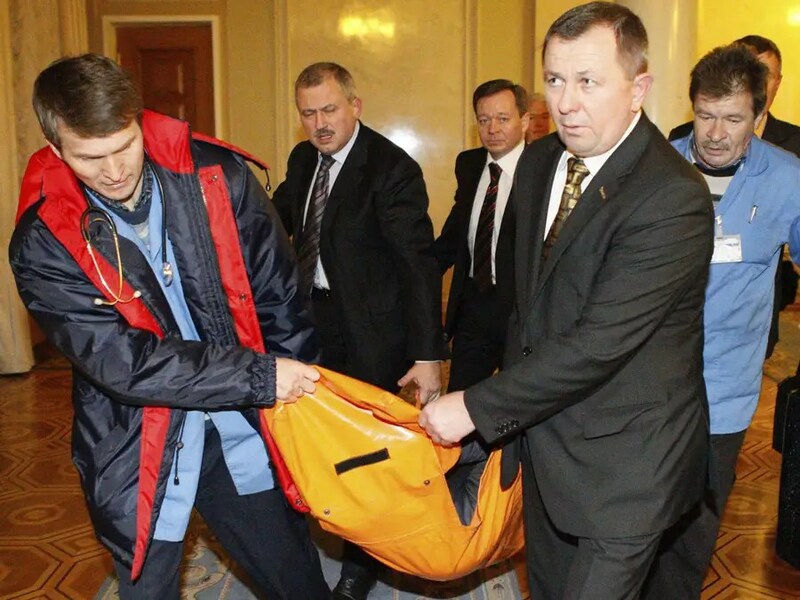 One member of the Ukrainian parliament even had to be carried out on a stretcher after a particularly violent struggle. 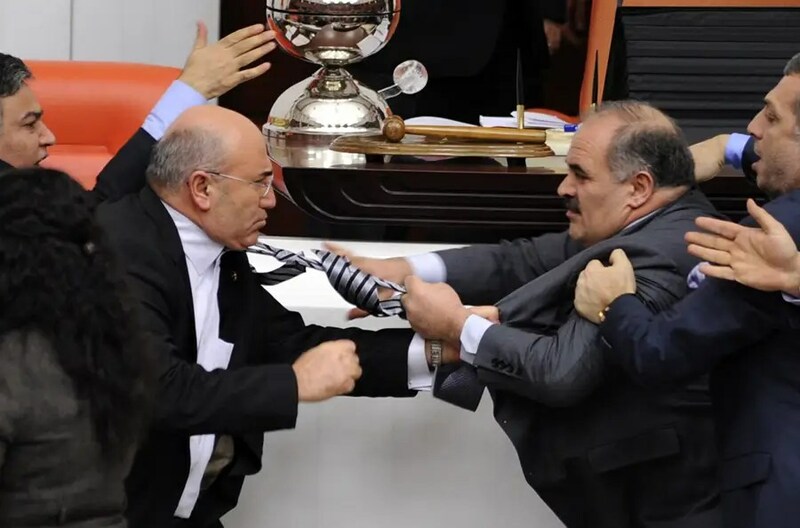 Ties were convenient weapons for these Turkish lawmakers. These Turkish MPs took it one step further. 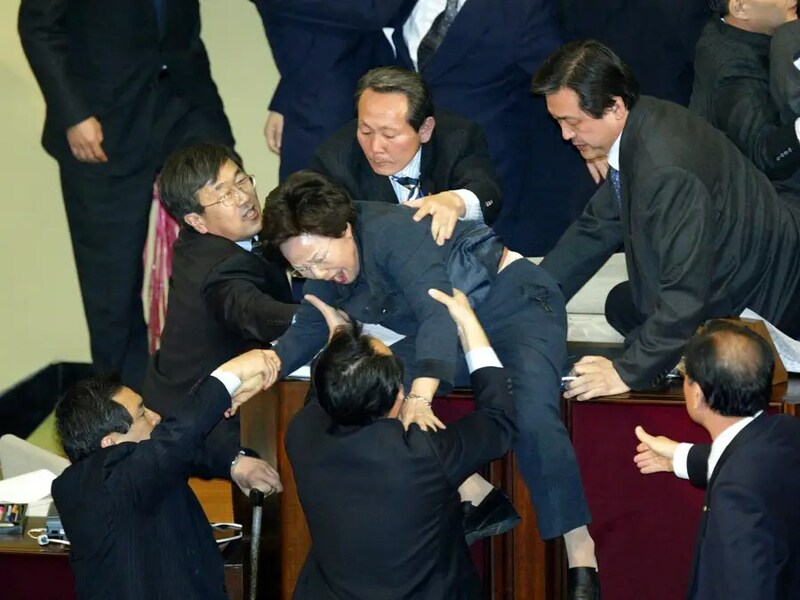 This South Korean lawmaker was so against the 2011 US free trade agreement, he threw a tear gas at the National Assembly chairman. 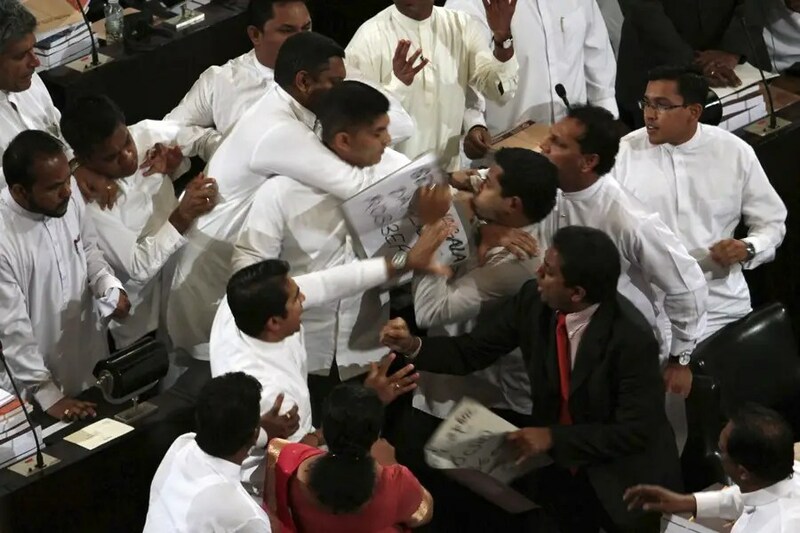 Members of the Sri Lankan opposition turned violent when the President presented his 2012 budget. 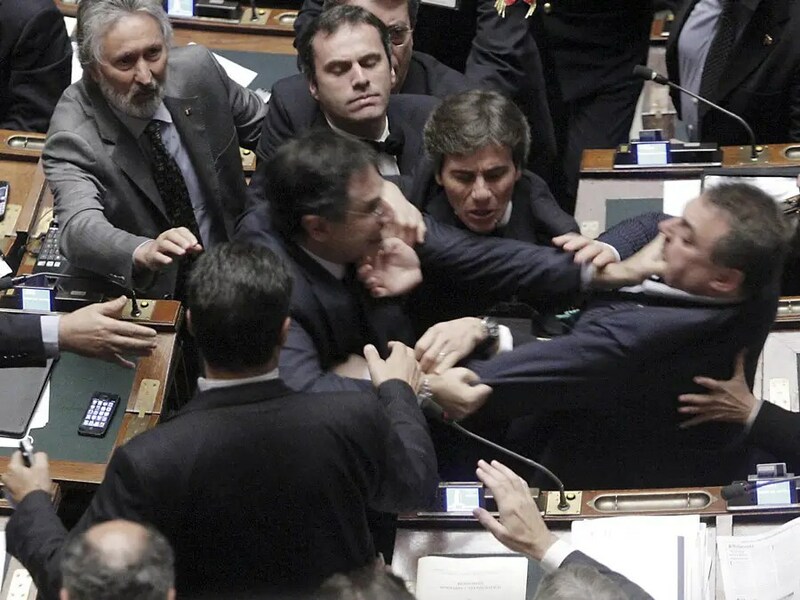 Austerity debates devolved into an all-out brawl in the Italian Parliament. 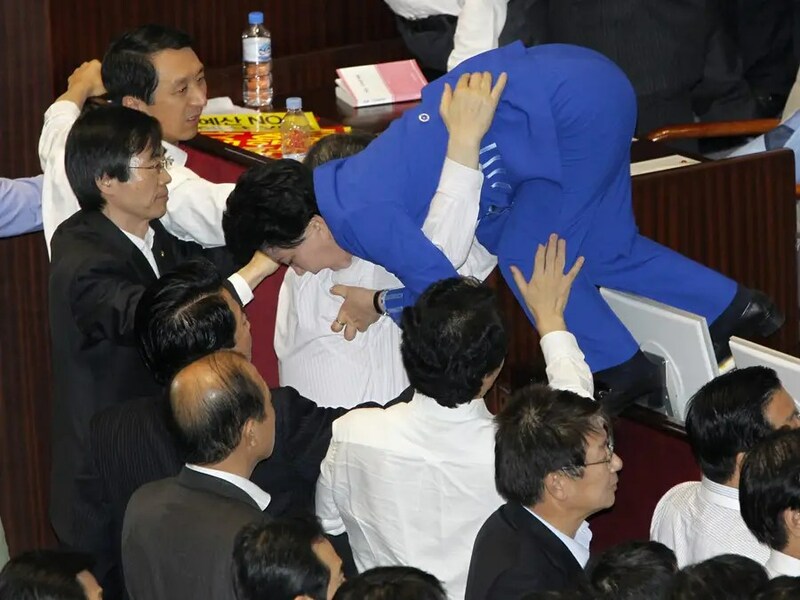 This South Korean lawmaker tried to escape a fight over an environmental bill. In Taiwan, members of the opposition party mutinied against the ruling party during a heated election year. 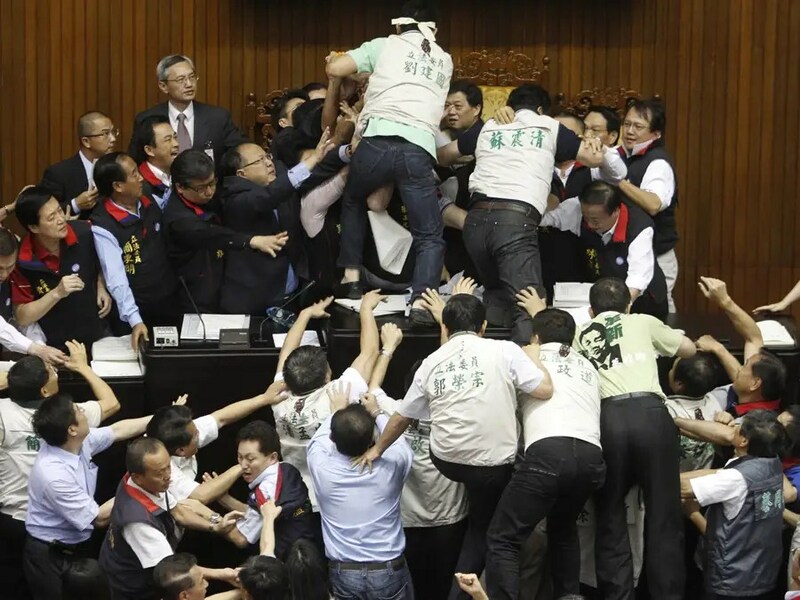 Taiwanese political brawling is also remarkably common. 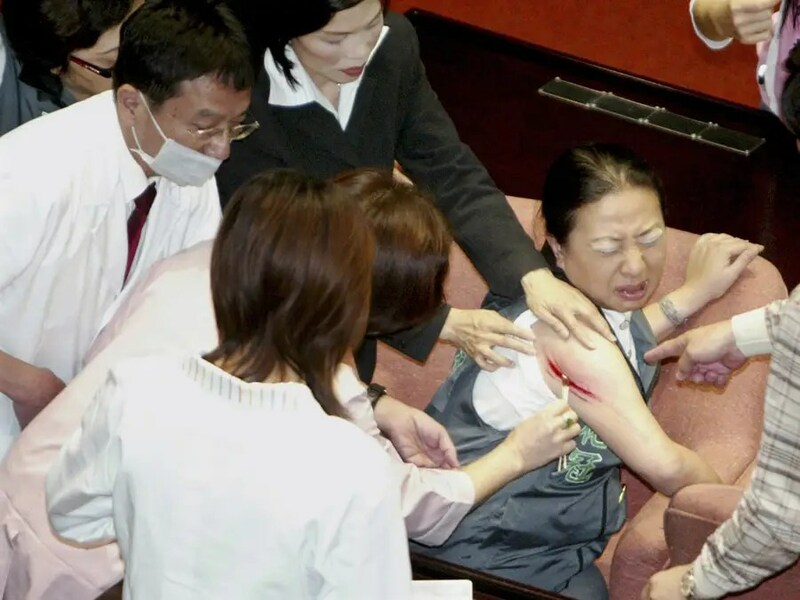 This legislator was injured after lawmakers started hurling stones and lunchboxes at one another. 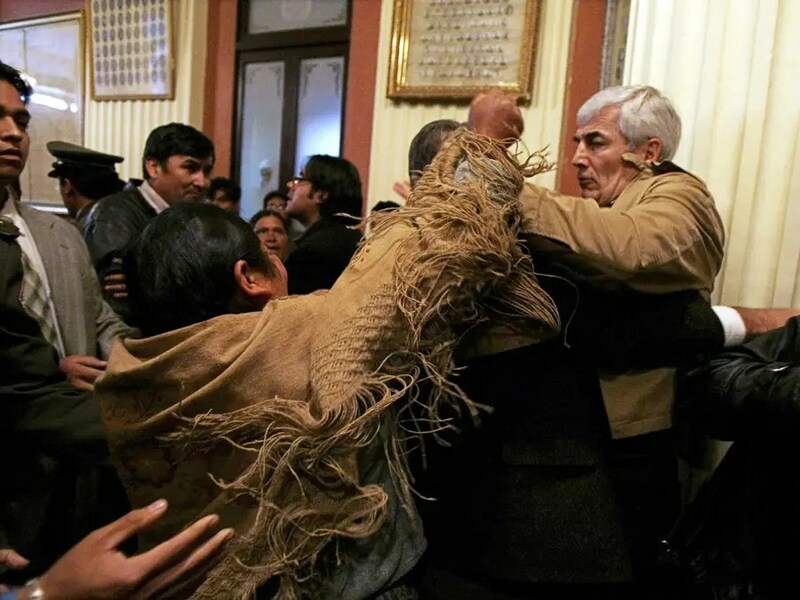 In Bolivia, an “unidentified indigenous deputy” attacked a member of the opposition during a session of Congress. 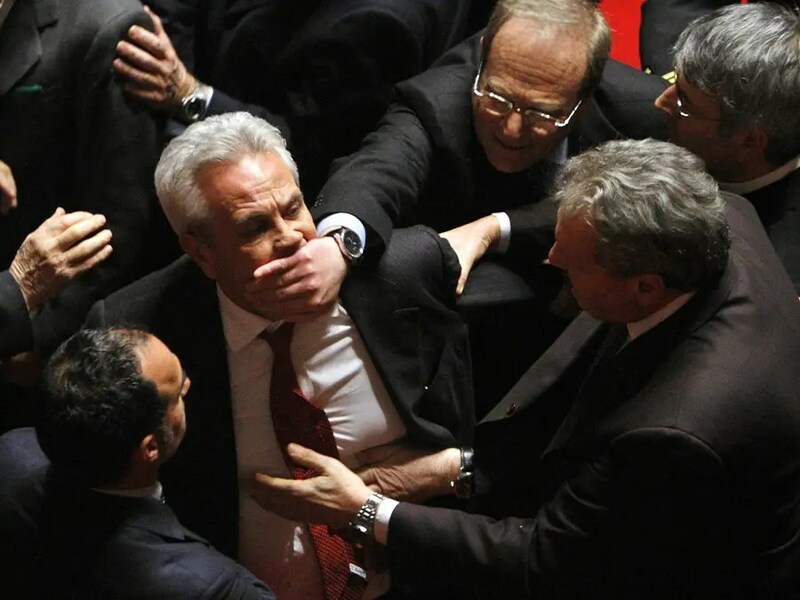 This Italian senator had to be forcibly removed from a confidence vote. 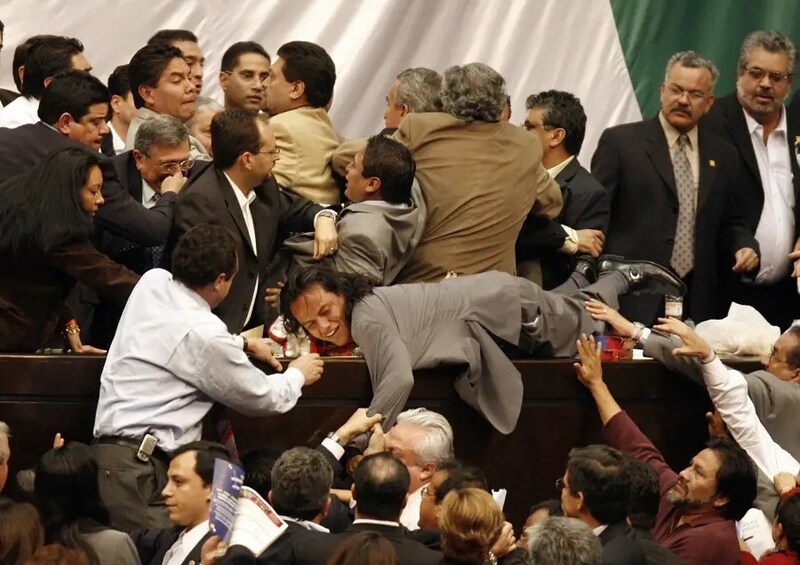 In Mexico, fighting broke out on the floor of Congress after one party attempted to take over the podium.